Bishop Steven G. Thompson is the Senior Pastor/Teacher at The Historic Leonard Missionary Baptist Church of St. Louis, Missouri since July 1989. In addition, he is moderator emeritus of the Antioch District Missionary Baptist Association. He has served as Vice-President of the Missionary Baptist State Convention of Missouri. In 1999, under Bishop, Dr. Thompson's leadership, The Leonard Missionary Baptist church began worship in its new edifice and continues to grow and glow in outreach and evangelism. An accomplished author and playwright, he has written several books and is a highly sought speaker, evangelist and counselor. Most recently, Bishop published his commentary on the Book of Revelation, " He That Has an Ear" ... Amazon.com; Barnes and Noble andother out-lets. Thompson continues to serve as Presenter/Instructor in the Antioch District Leadership Schools, Berean District Leadership Schools and Missionsry Baptist State Congress of Christian Education. Bishop Thompson is an award-winning gospel radio announcer and also a member of the Board of Directors for The Western Baptist Bible College in Kansas City, Missouri,The St. Louis Clergy Coalition, and The Minister's Union of Greater Saint Louis and Vicinity. 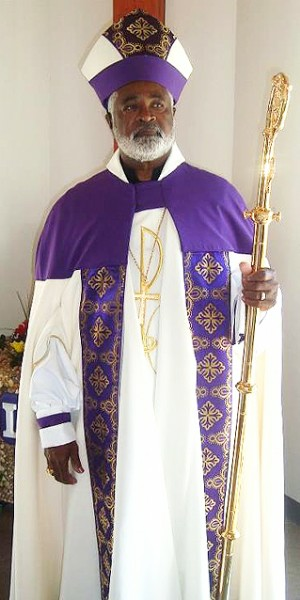 In August, 2011, Thompson was consecrated and elevated to the office of Bishop; New Life Fellowship Conference, Inc. of St. Louis, MO. In 1993, Thompson received a Bachelor of Arts Degree from Glad Tidings Bible College. A native of Arkansas, Bishop Thompson is a Husband (Merlean), Father, Grandfather and Great-Grandfather. © 2013 - 2019 Leonard Missionary Baptist Church - All Rights Reserved.